When it comes to installing a swimming pool, one of the most important stages happens before construction even begins: excavation. What many people sometimes don’t initially think about is that construction of an in-ground pool requires excavating the ground beforehand to make space for the pool, and that process has its own unique set of considerations. If you’re currently interviewing pool builders, make sure you ask them these five questions not only to see if they can give you satisfactory answers but also to establish expectations and create a productive working relationship. 1. What Can I Do to Prepare My Yard for Excavation? Start by removing or relocating outdoor furniture and grills, potted plants, play structures or trampolines, gardening tools, debris, and anything else moveable that could interfere with excavation and construction. You want your yard to be as clear as possible to accommodate workers and the heavy equipment that is required for the job. If you have immoveable backyard features such as planters or an outdoor kitchen, a competent pool builder will take precautions to ensure these areas or objects are protected from damage. Also, in order to access your yard and remove dirt, it may be necessary to temporarily remove gates or fencing. They should also take precautions to avoid damaging underground utilities such as gas or water mains, irrigation systems, and septic tanks or sewer lines, but it’s a good idea to ask about these concerns. 2. How Long Will the Excavation Process Take? Excavations can take anywhere from a few hours to a few days. Time is affected by the size of the hole that you are digging — the bigger the pool, the bigger the hole. With any outdoor building project, keep in mind that the weather and soil conditions can delay the process. Depending on your yard’s current layout, demolition may also be necessary. For example, if cement or other masonry exists in the space you plan on installing your pool, it will have to be broken up and removed, which can be slightly more time-consuming than digging alone. In a small percentage of excavations, particularly in rocky areas, excavation crews encounter large rocks and standard digging equipment is not enough to remove them. In these cases, the rocks will need to be hammered or blasted, and this can add extra time and expense to the process. Keep in mind, however, that while the vast majority of excavations do not require this additional work, it is something you should be prepared for. 3. What Do You Do With All of the Excess Dirt? To create the hole in which your pool will sit, a pool builder uses a machine called an excavator. Some excavators are quite large, but compact excavators such as a Bobcat are especially useful for maneuvering through side yards and in the oftentimes tight confines of a backyard. Once the excavator removes the dirt, sod, soil, rocks, or gravel from the space in which your pool will be built, some of that dirt could be replaced around the finished pool in a process called backfilling. Since not all dirt can be used for backfilling, excess dirt is removed from your yard by dump trucks and hauled away for disposal or uses at other locations. Either way, you won’t have to worry about getting rid of the dirt. 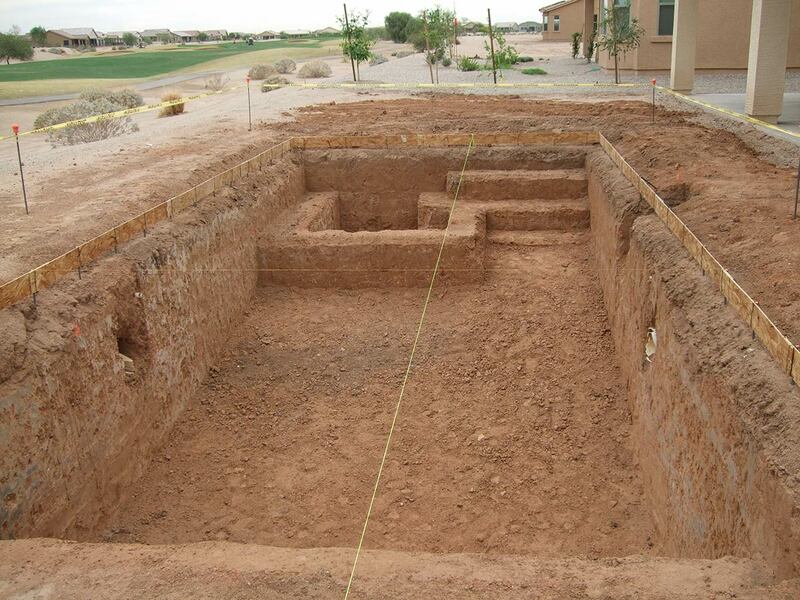 A reputable pool builder will take care of removal as a standard part of the excavation process. 4. How Will the Excavation Process Affect My Neighbors? There’s no sugar-coating it: Pool excavation is a messy and noisy job. By moving tons of dirt with large machinery, a fair amount of dust and racket will be generated. Luckily, as discussed above, excavation does not take long, so the impact to your neighbors is not drawn out. It’s a good idea to speak with your neighbors ahead of time and inform them when the excavation and construction of your pool will be happening. 5. Can I Save Money by Digging the Hole Myself? With a lot of research and know-how, it might be possible to save some money by excavating yourself, but the cost of excavation relative to the other parts of the process is fairly minor. Also, keep in mind that a pool excavation is a big job and usually involves obtaining permits from local agencies. We generally recommend to our customers leaving the excavation process up to the builder. An experienced pool builder will know the safest and most time- and cost-effective ways to complete an excavation.